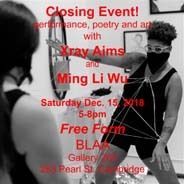 There will be a closing event for FREE FORM on Saturday, December 15. BLAA and 263 Gallery put together a really great show. And I'll be performing with a few friends. Come along. Truth Serum's videos on YouTube. if you need to reach me: alizashapiro @ gmail.com but close the gaps. TWO Dr. Sketchy's: Anti-Art School A MONTH !!! Dr. Sketchy's: Anti-Art School is the life drawing session you dreamed of in your deviously creative art school head. Hot models with crazy costumes, sometimes genderbending antics, poses that keep your interest for hours, nice folks around you, drinks, and it's cheap. The models talk and keep you entertained, there's good music, you could win prizes for good and bad art! You don't have to be a good artist, or someone who draws everyday. Dr. Sketchy's is a great place to start back up with your practice, or to try to pick up a new creative outlet. Check out the photos section for images of past Sketchy's Sessions. Check out the Dr. Sketchy's Tumblr Group Blog where you can upload drawings! HERE! email heyyou @ truthserum . org (but close the spaces) to register for classes, ask questions, or volunteer.